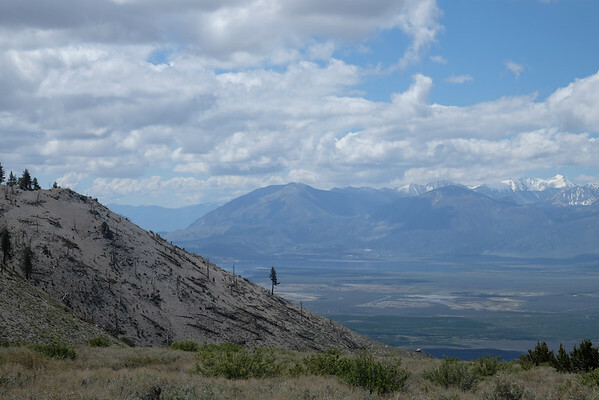 Before leaving the area south of Mono Lake, we decided to drive in a little further and take a hike. 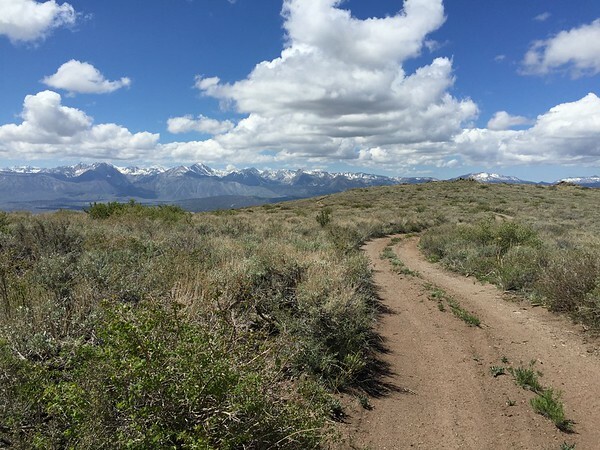 We found a dead end road that was not appropriate for Vance and hiked up it to see some great vistas (3.62 km, max elevation 2842m or 8324 feet). 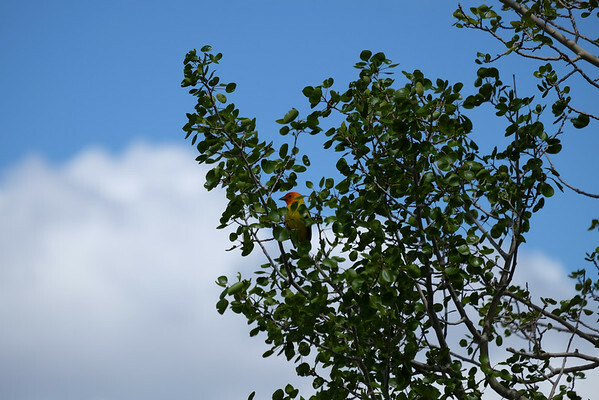 On our walk down, we saw this very bright coloured bird. Any idea what type it is? On our way back from the hike we saw some ATVs or Motorcycles. That was the first sign of human life we saw since we entered the forest. We did, however, see some hares and some deer. It was nice to have a quiet campsite, however, the morning was rather chilly. What we learned from this wild camping experience is that we would like an van/RV with at least a single burner stove. That would allow us to cook even when there are fire restrictions, but also would make it a lot easier to make up a pot of tea. 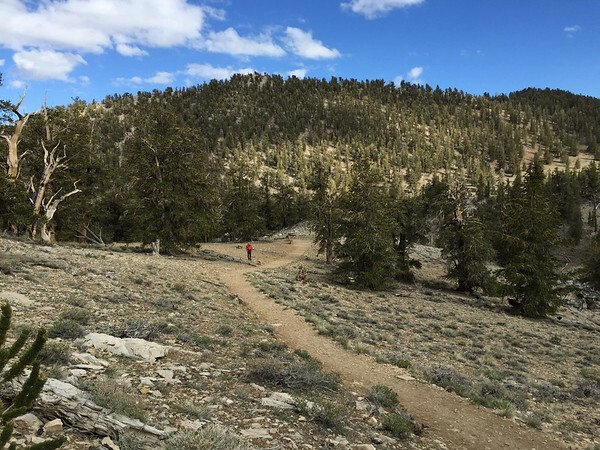 Having completed a morning hike, we headed out of the high country along highway 120 east to highway 6 then down to Bishop, which has a real grocery store and is known as the place to stock up before heading out into the Eastern Sierra. 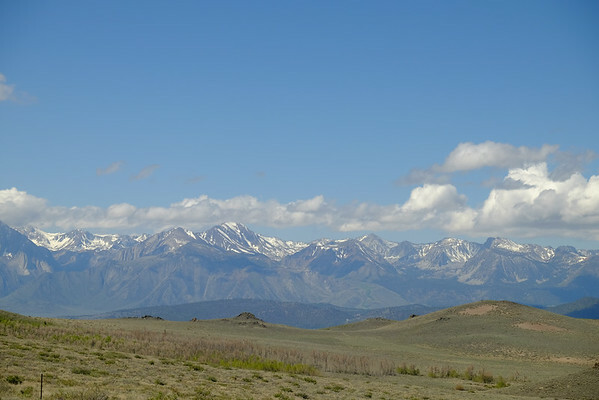 The drive down was interesting – there is mostly dessert and alpine shrub in the valley between the tall (snow on top Coastal Mountains that remind me of the Mountains in Kitimat) mountains of the Eastern Sierra and the White Mountains – which are not as tall. 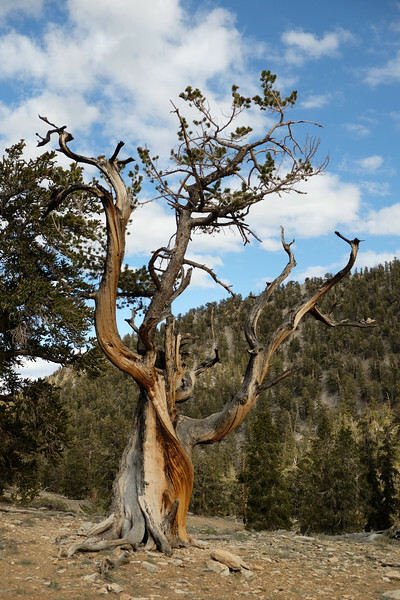 It was while we were in Bishop that we decided our next destination would be the Ancient Bristlecone Pine Forest. 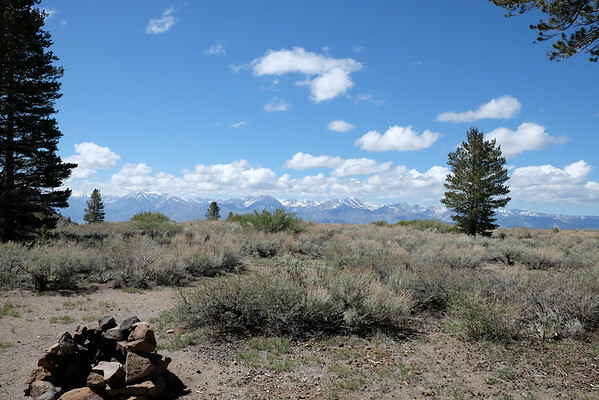 We stopped at the Ranger Station in Bishop and got some information on camping from the Ranger. 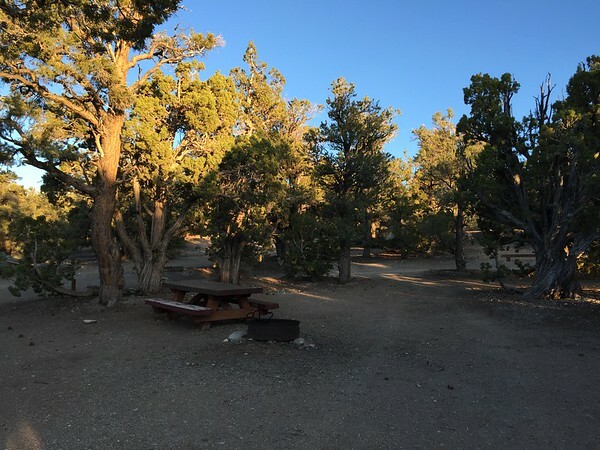 There is a nice campsite not far from the Visitor Center called the Grandview Campground. The fee is $5 per night paid on an honour system. The campground itself has nice clean pit toilets, but no water. Fortunately, the ranger warned us about the lack of water at the campground, so we refilled our drinking water and our water bottles before driving up. 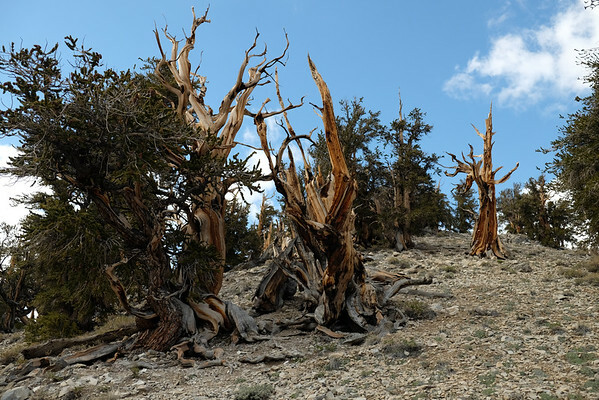 When I first heard about the Ancient Bristlecone Pine Forest I thought, why would I want to see a Pine Forest? I grew up in Northern British Columbia, in the middle of a bunch of Pine Forests! 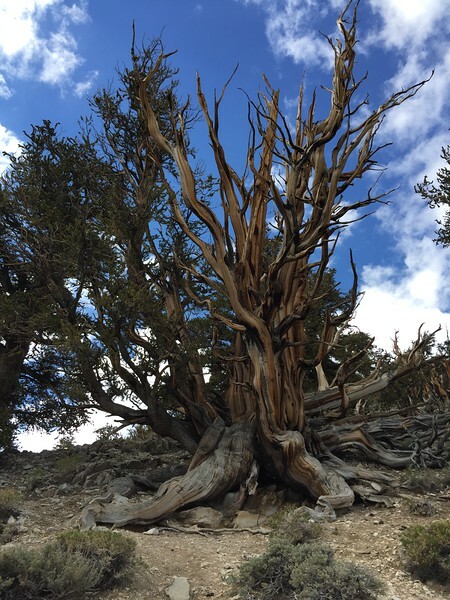 I truly had no idea how truly amazing, and different, the Bristlecone Pines are. 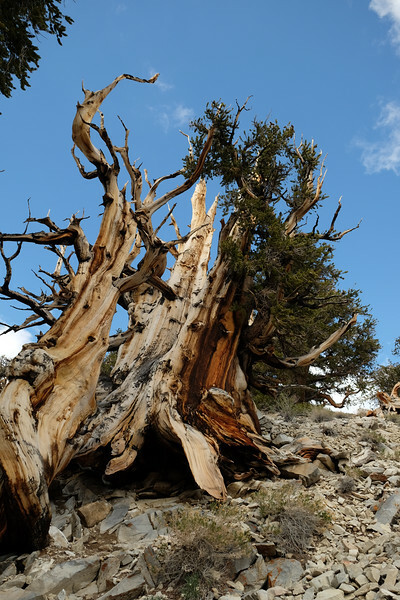 These trees are 3000 – 4600 years old. They are 2000 years older than the giant sequoias in the Calaveras Big Trees State Park. In the end, our walks through these ancient forests were definitely the highlight of my trip. 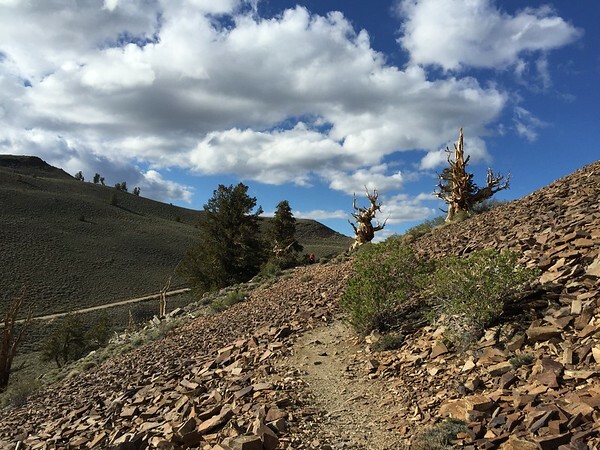 Before setting up for camp, we continued further up the road to the visitor center at Schulman Grove. 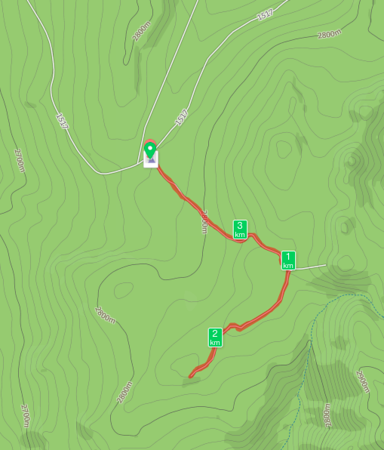 There we learned of a short hike (1-mile loop) called the Discovery Trail. 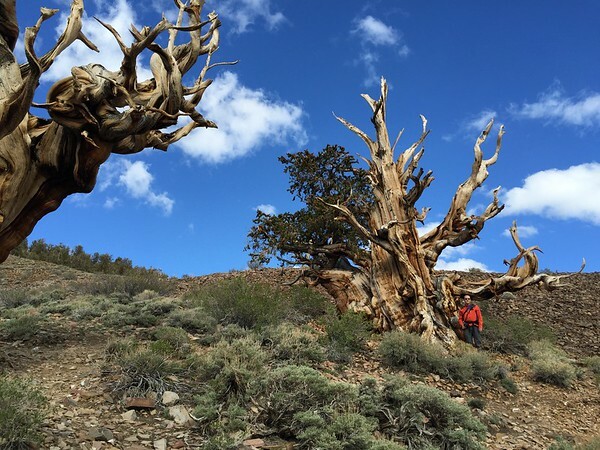 We decided this would be a nice way to see some of the Ancient trees before we setup camp for the night. 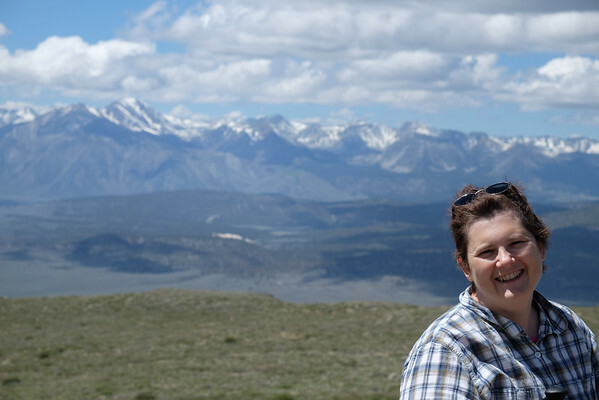 We hiked 1.83 km (highest elevation 3145m or 10318 feet). 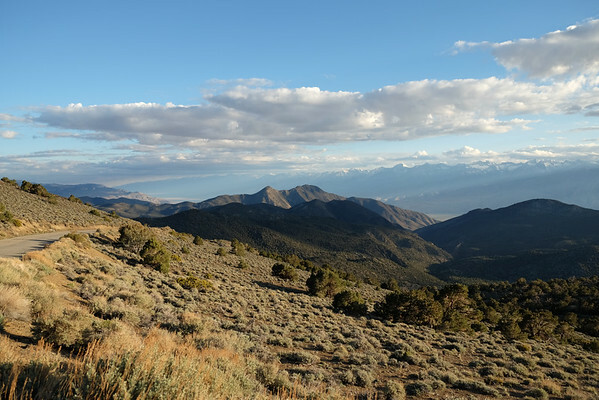 Unlike the Redwood forest, there are very few types of vegetation that are able to live in the harsh environment. When I first saw these areas, I thought it had previously been logged and this was secondary or tertiary growth. 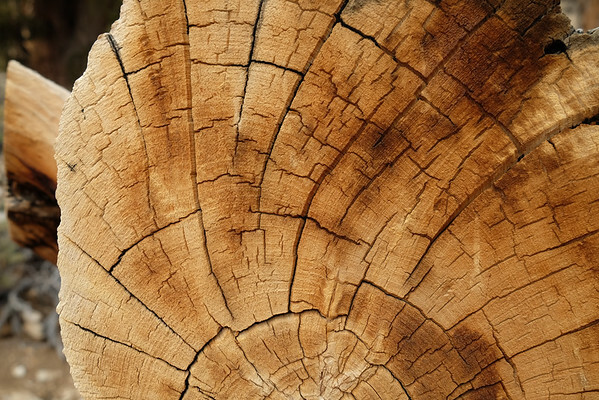 Fortunately, the old really dense trees did not make for good wood for building houses or ships masts. 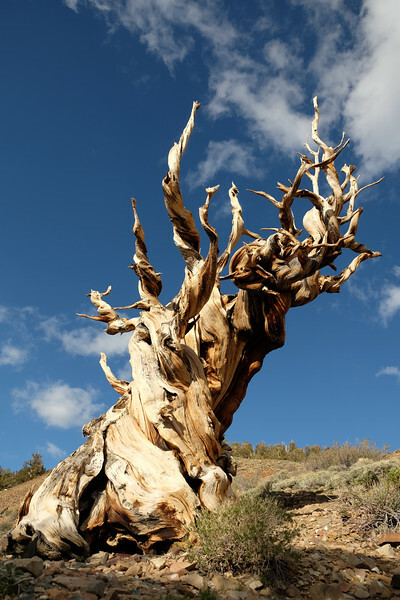 It was a chance discovery by Dr. Edmund Schulman, in 1957 he took samples from a tree to study climate records only to discover the worlds oldest tree (at 4600 years old!). The trees are rather spectacular. They are able to survive with only the smallest bit of bark along the trunks. You can tell this tree is still alive by the green foliage. Even dead shells of trees will remain standing for centuries. On the steep hills, the ground underneath the trunks erodes as centuries pass. The lower side of the trees are no longer alive, but the upper sides still have their roots firmly planted. 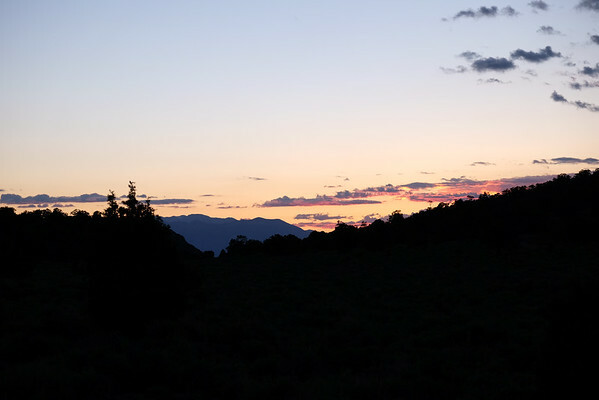 And we even had a pretty sunset. A nice way to end the day.